Hard to believe we are one month into 2015. Despite my resolutionsto do frequent blog updates; use stash; not buy more fabric and not begin any more projects until the UFO pile shrinks I jumped feet first into newness and forgot all my best intentions. And I began with small pieces .. I did raid my scrap box for Pat Sloan's HipTo Be Square challence. So far there is space for 375 2 1/2 squares in my scrap bin. At least it is a start. I think my scrap useage is controlled random because I have trouble just pulling bits and stitching them together. I will also work on the Sloan Mystery 2015 .. Vacation Time. I am stitching this in two different colorways and mostly stash . I did however need to buy a lovely green to match the flowers. And a picture in the snow seemed to fit the weather. These are paper piecing blocks from The Adventurous Quilter's 2015 BOM. Last fall I picked up PP again and am enjoying how relaxing it can be. I am also playing with these pretty fabrics for the We Support You blog hop hosted by Sew WE Quilt. Watch on Feb 6 for my creations. We are in the middle of a snow/freezing rain/ice pellets combination so the happiest place for me might be stitching with a cuppa near by. You said your pieces in the little squares quilt are very tiny. I am curious to know their size. Are they 1 1/2" pieces or smaller? I love all of your projects. 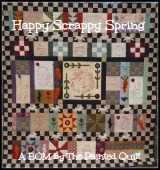 You have some lovely projects on the go , love your scrappy 2.5" project . Hi Fran - Love this tiny squares. They look like a lot of work. Not sure if I could do it. Lovely!